This new image from the Wide Field Imager (WFI) on the MPG/ESO 2.2-metre telescope at the La Silla Observatory in Chile reveals a cloud of hydrogen and newborn stars called Gum 41. A distant group of hot, young stars cause a cloud of hydrogen gas to glow a rosy red 7,300 light-years from Earth in the latest amazing view from a telescope in Chile. Called Gum 41, the cloud stars in a new photo released by the European Southern Observatory today (April 16). Radiation emitted by the newborn stars near the middle of the image gives the hydrogen a rosy glow, ESO officials said. You can explore the new nebula photo in a video produced by ESO. The red glow of the nebula is not easy to see visibly, ESO officials added. Gum 41's faint appearance could explain why the object wasn't discovered until the 20th century. Australian astronomer Colin Gum discovered Gum 41 — which is actually part of the larger Lambda Centauri Nebula (also called the Running Chicken Nebula. He published his findings in 1955, ESO officials said. Gum 41 is located in the constellation Centaurus, The Centaur. This area of the sky plays host to many bright nebulas associated with brand new stars forming from clouds of hydrogen, according to ESO. 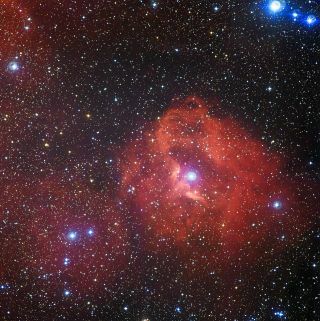 And Gum 41 isn't the only glowing red cloud in deep space. "Another famous example of this phenomenon is the Lagoon Nebula, a vast cloud that glows in similar bright shades of scarlet," ESO officials said in a statement. A telescope at the La Silla Observatory in Chile captured the new photo of Gum 41. The observatory is run by ESO, an intergovernmental astronomy organization supported by 15 countries in Europe and South America.